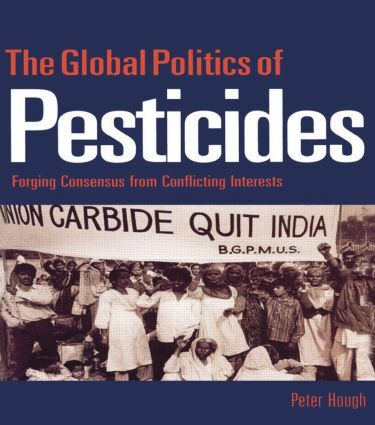 The Global Politics of Pesticides explores the varied, and often conflicting, interests involved in the formulation of international policies on chemical pesticide manufacture and use in each of the main areas of environmental pollution, trade, development, public health, food security, biotechnology and industrial safety and explains why some aspects of pesticide use are subject to strict international guidelines whilst others are not. The book breaks new ground in objectively examining the competing viewpoints of food producers and other pesticide users, the chemical industry, health officials, traders, environmental/consumer pressure groups and the public. It also considers how international regulation can occur in spite of the fundamental differences of opinion and seemingly opposing interests held by the key actors. 'Pesticides pose one of the greatest dilemmas of our time. The science of pesticide use has become an accepted part of industrial food production systems, relied on to provide the levels of food production required to provide the levels of food production required y a burgeoning world population. But there is widespread unease not only among the general public, but also among farmers and scientists about agricultural and public health systems which are based on the deliberate introduction of toxic products into the food chain and the environment. Many question whether the regulations which govern pesticide use are an adequate safeguard against the known or potential health and environmental problems. Peter Hough's book is a timely and thorough survey of these predicaments. It provides an excellent insight into the national and international bodies of responsible for safeguarding public health and the environment, and an important overview of existing regulations and current debates. This book is required reading for those concerned about food, agriculture or the environment.' Barbara Dinham, The Pesticides Trust. 'This stimulating analysis demonstrates how some of the problems associated with the use of pesticides, notably contamination of food, have been successfully regulated at the global level, while campaigns by non-governmental organizations on other problems have yet to make an impact. Both environmental activists and students of international relations will be fascinated by the conclusions that discuss under what conditions international regimes can be established' Peter Willetts, Professor of Global Politics, City University, London.